Over 40 Amateur Of The Week: Mature Muscle! Bill reentered the competition scene after taking decades off. See how quickly he rebuilt his muscular frame and won a pro card at age 45! I started wrestling at age 6 and continued through college at Slippery Rock University. I was extremely competitive. When I stopped wrestling, I looked for an outlet and decided to try natural bodybuilding. 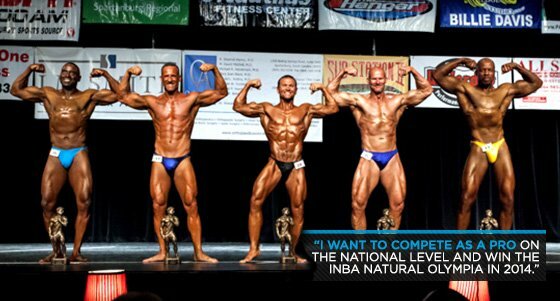 I competed a few times and won a state show at age 22, more than 20 years ago. On January 1, 2012, I decided I needed something more to keep me in the gym and wanted to compete naturally again. I knew it would be tough. I hovered at 200 pounds with very high body fat. I&apos;m not the type of person to enter and get tired of it. I was in it to win and started that day with a goal to compete in a natural South Carolina state show called the Carolina Supernatural. I change up my workout regimen every three months so my body doesn&apos;t get accustomed to the same routine. I use the following workout currently and stay consistent on it. I start every workout with a 10-minute light walk to get the blood flowing. I also do 20-30 minutes of cardio every morning except on Sunday when I wake up on an empty stomach. I work out at 6:30 every evening and Sunday is my off day. I stick to my nutrition plan 100 percent. The most important part of a natural bodybuilder&apos;s training plan is the diet. You can&apos;t deviate from it. I re-feed for four hours on Saturday evening after my carb depletion. I consume 1000 grams of carbs, normally in the form of pancakes and syrup, oatmeal and honey, rice, frozen yogurt with fruit, and/or cereal, alongside my protein and as little fat as possible. Depending on how I feel, I eat whatever I can consume in that 4-hour window until bed. As a natural bodybuilder, I believe supplementation is the only way to maximize your potential. My passion for the sport feels similar to wrestling because it&apos;s an individual endeavor. There&apos;s nobody to blame if you fail and that motivates me every day. The dedication it takes to excel at this sport is something many can&apos;t understand. The difference between being in shape and stepping on stage in peak condition is night and day. My inspiration comes from my family and faith. I want to compete as a pro on the national level and win the INBA Natural Olympia in 2014. If you want to succeed and compete, stick to your training program and nutritional plan 100 percent! Doug Miller. He&apos;s from my home state (Pennsylvania) and I admire his physique and philosophy. He practices carb cycling and his following quote is where we agree most: "I never stray from my diet when preparing for a show and always eat extremely clean year round. It&apos;s important to stay lean in the offseason so the journey is easier when it&apos;s time to diet down." Bodybuilding.com was the first place I went to when I decided to compete again. It&apos;s the first site I open in the morning and the last site I visit before bed. I get my supplements from this site and developed my training programs and nutritional protocols its various articles. I use Layne Norton&apos;s contest prep articles most to get ready for contests. I also read the featured articles and transformations daily and venture to the forums (for entertainment purposes).